In the midst of a promising career as a scientist and academic neuropsychologist, I made the unusual decision to go back to school (at the Jewish Theological Seminary) to study for the cantorate. My department chair at the time made the off-handed comment in an interview that it was like watching your child go off to the circus (this from a knowledgeable Jew who often served as a lay “cantor” in his synagogue). Why did I need to go to cantorial school? After all, many years of Jewish education and especially Jewish camping had left me with a very good working knowledge of cantillation and nusach ha-t’fillah; I was a classically trained musician and had a good voice. What more did I need? My response to that common set of questions has remained the same to this day—namely, that I wanted to be an authentic cantor, an authority on synagogue liturgy and music, and I felt the only way to truly achieve that goal was through seminary study, and eventual investiture by a religious body. This sensibility not only explains an important part of my professional life-story, but also comprises the subject matter for Judah Cohen’s excellent book. In its nearly 300 pages (with footnotes) and accompanying CD, Cohen successfully navigates a complex waterway, melding history, ethnography and Jewish professional studies with a musicological account of cantorial education in the early 21st century. Cohen’s perspective is at once narrow and layered. His metaphor of a prism – which he uses in various ways throughout the book – seems apt to describe the work itself, attempting as it does to pull together a spectrum of influences and spheres into a pointed discussion about cultural and religious authority. As the primary piece of his doctoral research, Cohen spent nearly three years at Hebrew Union College’s School of Sacred Music, living, learning, and teaching alongside his research associates (i.e., the cantorial students or “aspirants,” as he calls them). Cohen spends some time describing the various roles he played at HUC, and the approach he took to establish himself first and foremost as a graduate student researcher. That said, his active participation in the academic and social lives of these same students (e.g., as a tenor in their choir, teaching an ethnomusicology class) provided him with a unique window into his subject matter. In the first half of the book, Cohen is interested in motivating and describing the office of the cantor—its history, scope and educational pathways—as well as the tug towards that office expressed by students at HUC. The second half of the book concerns itself with a very small, albeit extremely significant aspect of cantorial education at HUC: the Synagogue Practicum. In this weekly meeting in front of the school community, students have the opportunity to bring together and present repertoire in a mock religious service to demonstrate their emerging knowledge base and skills. The practicum is not only an educational vehicle, but an important communal experience that helps to reinforce mentorship and forge collegial relationships that will follow students into their professional careers. This section of Cohen’s book also presents much of the musical material under consideration, analyzing the “cantorial sound” that students are working to craft. Cohen gives important weight here to the issue of the woman’s voice in the modern cantorate, and some of the issues that result in adapting a repertoire written largely for men to the different timbres of the female practitioner. Musical examples are given on the accompanying CD, and consist primarily of student voices. In addition to the musical examples on the CD, peppered throughout Cohen’s discussion are lengthy quotes from students and faculty of the school, cited to demonstrate and/or support some piece of Cohen’s argument. In this way, concepts are concretized and contemporized, making for a more grounded exposition. The cantorial world being a relatively small one, I knew many of the individuals quoted. It was particularly interesting to glimpse the students’ incipient perspectives on issues such as the role of traditional music (including nusach) in the present and evolving Jewish communal life. Despite the broad palette of opinions and experiences represented in this work, its scope is limited to the world of Reform Judaism, a fact that begs the question of how broad its implications are, musically or sociologically. 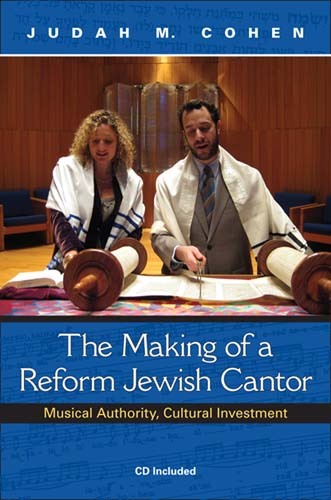 My own views as a fairly traditional Conservative cantor, for example, are (perhaps not surprisingly) rather different in many key areas discussed, as is the basic repertoire from which I draw most of my musical choices as a cantorial practitioner. However, these facts do not detract at all from Cohen’s work or from his understanding of one of the important goals of cantorial training, namely a “multidimensional inheritance” that “[s]imultaneously bring[s] several key time periods, locations, and sonic norms to a reckoning in the present” (239). Speaking of scope and goals, academics might ask how Cohen’s differ from other scholars who have charted similar waters. As an ethnomusicologist, Cohen’s use of musical authorities to map out cultural norms and musical practice is of course not unique. However, Cohen is not merely tapping the knowledge base of musical authorities as a means to gather data; his goal is to understand the creation of musical authority itself, specifically that of the Reform cantor in the 21st Century. In realizing this goal, Cohen has provided us with a rich and unique work that will no doubt hold the interest of Jewish historians, musicians, and of course cantors, themselves. You need to review the honmcoeimg scene in the Moyshe Oysher film Dem Chazzen’s Zun (The Cantor’s Son) made in the 1930 s copies of which are available commercially from the Brandeis University Jewish Film Archives. This Yiddish comedian character, Shepsil Kanarek, appears in the movie as a supporting character, again with the business of a chazzan from Pouchkeepsie, but now on a search committee which finds its cantor in the voice of Moyshe Oysher, aka Saul Reichmann, a newcomer to America.Shepsil ends up being Oysher’s agent , but eventually they return to Moyshe’s European shtetl where he meets his childhood playmate now grown to a beautiful young woman. Oysher’s father has him daven for Shabbos and the Musaf Kedusha scene is the source of the march-like tune which Kanarek satirizes. The original scene is well worth seeing.